There are only two Alaska fishing resorts that are 5 star-quality luxury destinations: The Alaska Sportsman’s Lodges. These two beautiful giant lodges are remotely located in prime sport fishing regions of Alaska’s Bristol Bay watershed area. Alaska fishing resorts just don’t get any better than these award-winning locations. With one lodge located along the Naknek River, and the other located on the banks of the Kvichak River, the world’s most productive fishing waters flow right past our guests as they relax on the front porch. We guarantee that the all-inclusive fishing packages at these fishing lodges will exceed even the highest of expectations. 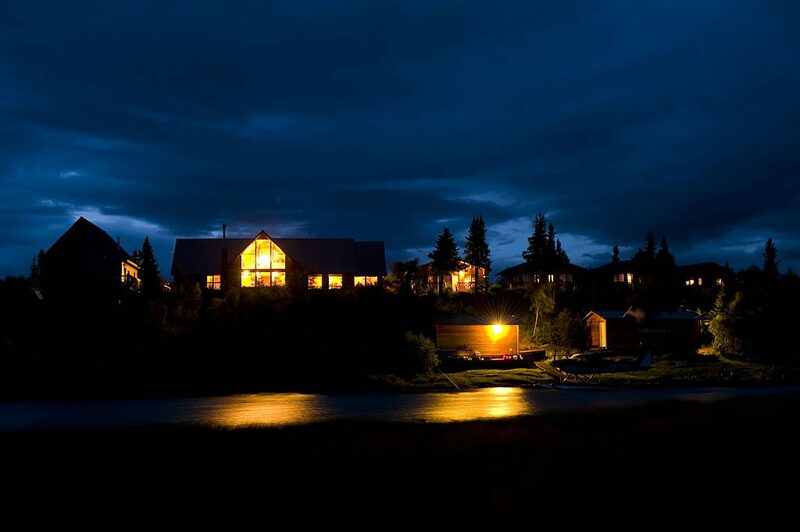 The Alaska Sportsman’s Lodges offer endless opportunities for adventure by day and luxurious comfort by night. The main buildings of these Alaska fishing lodges are built of solid, beautiful cedar wood that creates a very rustic yet sumptuous feel. The high majestic ceilings frame the giant multi-storied windows that overlook the pristine Alaska wilderness. There are plenty of giant couches to sink into as you prop your feet up after an exciting day of fishing. We have full-service bars and kitchens at each of our resorts. We are known for our 5-star service and our delectable meals. The Alaska Sportsman’s Lodge, which is located right on the bank of the world famous Kvichak River, was awarded the 2005 Orvis Award as the best fishing lodge in North America. Once you become our guest you will see why. With the mighty Kvichak River rushing by the front door, the most lucrative fishing areas in Western Alaska are only a few steps away. This river is busting with trophy Rainbow Trout, as well as King, Sockeye, Chum, Pink, and Coho salmon. Lake Iliamna is a mere 4 miles upriver from the Alaska Sportsman’s Lodge, and these aggressive fish are eager to get there! The Alaska Sportsman’s Bear Trail Lodge is built right on the Naknek River, and it is just as fabulous as The Alaska Sportsman’s Lodge. The Naknek River was declared the number one source for Rainbow Trout by the Fish AK Magazine. Imagine such a river flowing only a few steps away. One of the most reveled aspects of this remotely located lodge is the fact that its shores never become a fisherman’s battle ground. In other words, our guests do not have to brush shoulders with other fishermen or haggle for a spot on the river. This lodge is located deep in the Alaska wilderness where the only thing a fisherman might have to share the river with is Bull Moose or even a Grizzly Bear.